My last night in San Francisco on my first and unknowingly not my last trip, I really struggled to come up with a good idea of something to keep me occupied that evening. I wasn’t in town with any coworkers this time so I needed to find something on my own. I asked around the office I was working in for some ideas when they started talking about having a beer. It occurred to me I had noticed on the map the other day a local brewery, but felt it was too far away to take a trip to for just that. I started researching and found they had a taproom across the street from my hotel. I also found 3 microbreweries within sorta kinda walking distance, if you are like me and don’t mind walking several miles. If you didn’t know already, I love beer. I love craft beers. I love dark craft beers. I tell people it’s a main staple of my diet along with pizza, burgers, whiskey and Chinese food. I’m even known to place religious holidays on hold (Passover) so I can drink beer on other days of great significance (Pirates Home Opener). Here’s the other thing, I usually do not like to drink this much alone. Drinking alone for more than one drink is kinda depressing, lonely and boring. The occasional Scotch or cocktail in the evening on the couch is nice. Getting drunk while yelling at the TV during presidential debates is acceptable too. However, tonight I decided to make an exception since my idea sounded like a lot of fun. 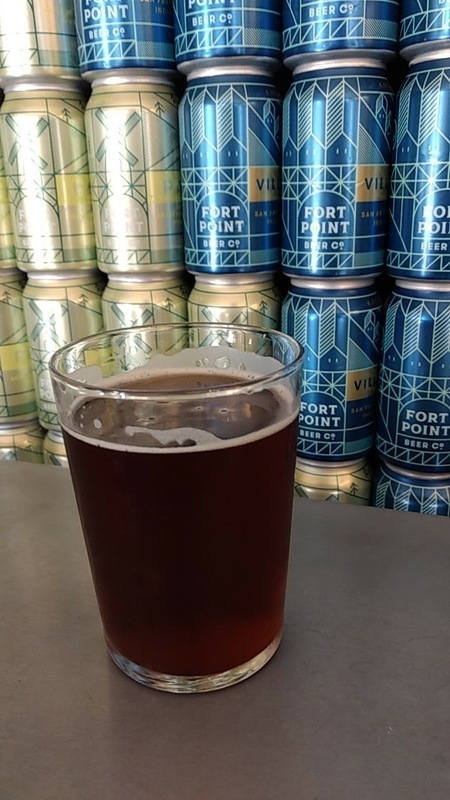 My goal was to visit Fort Point Taproom, Cellarmaker Brewery, Black Hammer Brewing, and 21st Amendment Brewery. Using Google Maps, I plotted out my course of an imperfect rectangle measuring 4.5 miles. I thought to myself I do bar crawls, I could totally do that easily. I checked with the guys in the office if they had been to any of the breweries and they had not. They did tell me once I left downtown the neighborhood got a little shady. I thought nothing of it. I also assumed their definition of shady was pretty different from my definition. I also had the great idea I would share this whole crawl on Instagram Stories and Snapchat. I was not very good at either prior to this night. I also didn’t even have the AlexEatstooMuch account yet. I probably overdo it on the stories as the night goes on and I have more to taste. After leaving the office for the day, I dropped my stuff at the hotel, freshened up and headed out to my first stop. 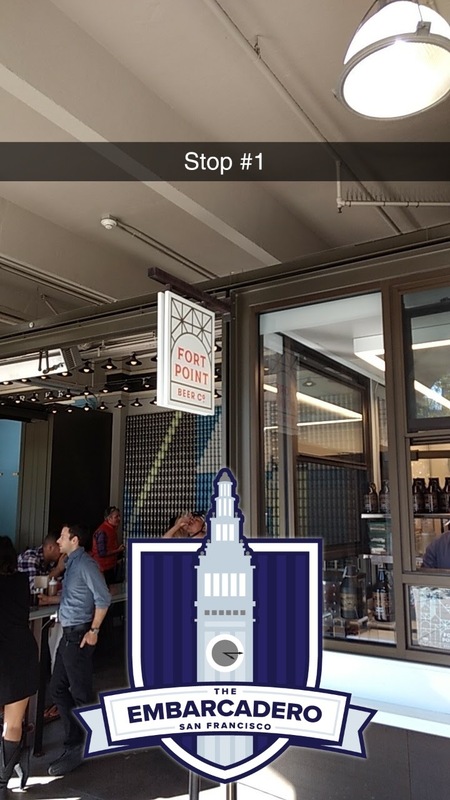 I started across from the hotel at Fort Point Taproom. I needed to start close as they were the only ones closing early. 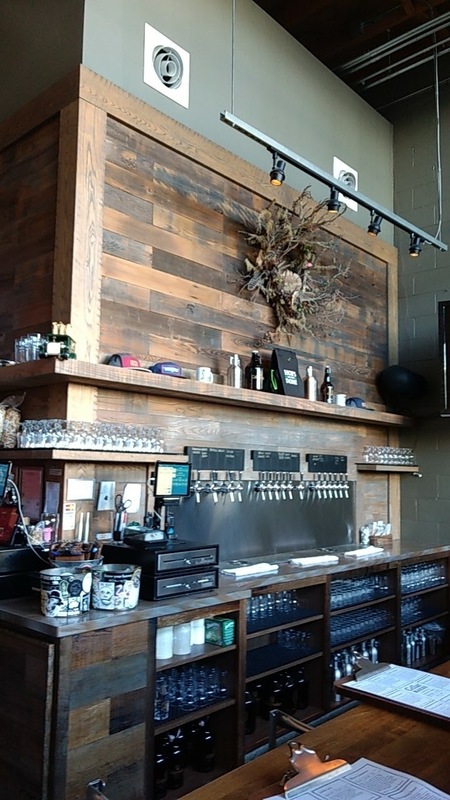 This taproom was in a covered outdoor seating area. Looking back, I wish I had gotten a photo of the entire wall. I got the Westfilia. It was an American amber red ale. At 5.6%, it was a smooth beer that went down pretty easy. It was a good way to start my crawl, but felt more like a happy hour spot rather than a brewery taproom. It definitely attracted the downtown after work crowd, which isn’t what I usually expect in a brewery. 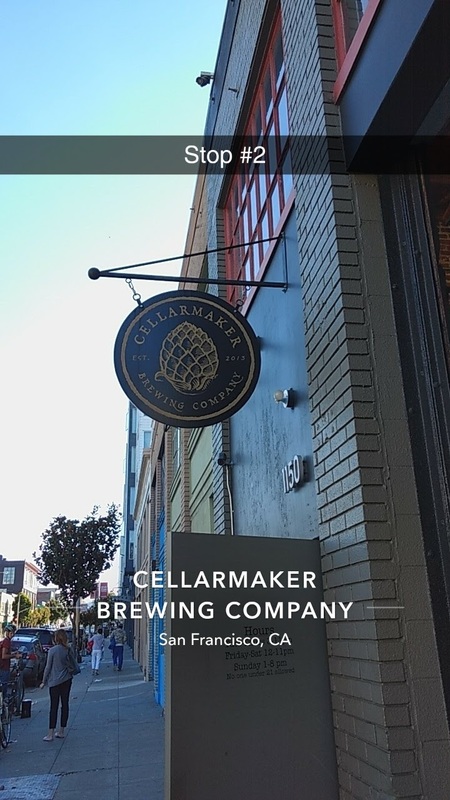 My next stop, Cellarmaker, was almost 2 mile away. I had to walk through the Financial District to what I was told was the shady part of town. Yes, it definitely looked a little more rundown, but it certainly wasn’t someplace I was worried about walking through. I think the most concerning thing I saw was one homeless man steal a half bottle of cheap vodka from another homeless man passed out on the sidewalk. It pretty much reminded me of walking down Liberty Ave. or Wood St. in Pittsburgh, which usually has a very interesting cast of characters. 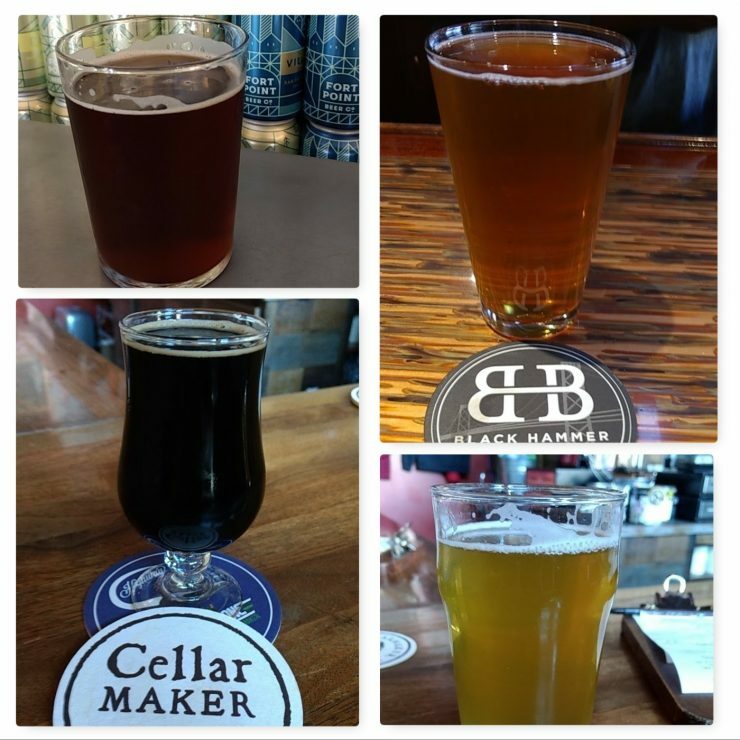 I finally made it to Cellarmaker. This place had a really cool indie vibe. Very small seating area but very well decorated. It was packed. This place has incredible beer. Probably rivals places like Brew Gentleman in Pittsburgh in terms of quality. I got the Vastness of Space aged in Manhattan barrels. This was a dark beer served in a sniffer glass. Oh wow. It was amazing. This was the beer that made me decide to add them to my crawl list when I looked up their brewery online. This might haven even been the beer that made me decide to go on this crawl in the first place. The Vastness of Space did not disappoint. It is an imperial stout with such a robust flavor with hints of whiskey overtones. It was 11.5%. I could tell this was potentially going to change the course of the night. I savored every sip. 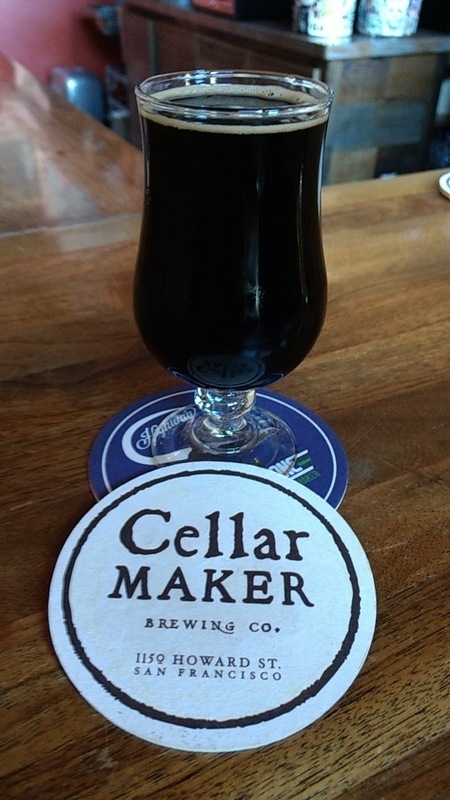 As an aside, when I was back in San Francisco with coworkers, I convinced them with little effort to visit Cellarmaker. I needed little effort to convince them with how much I talked it up. 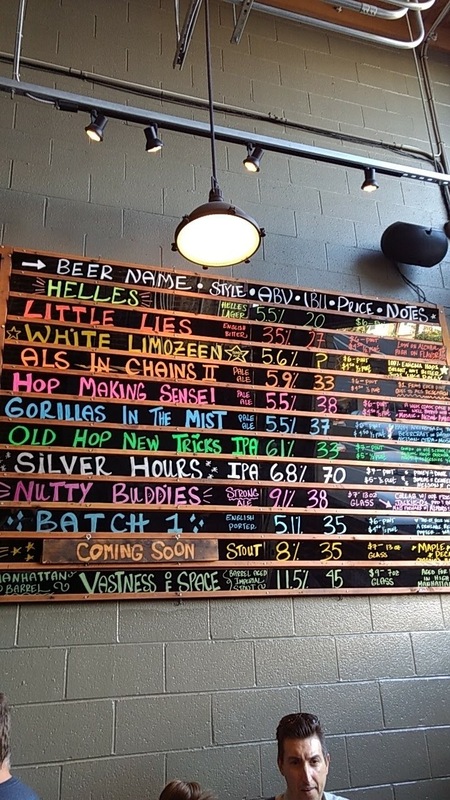 I got Vastness of Space again and newly tapped Maple Vanilla Pecan, an 8% stout that was so sweet and smooth. I do not think my coworkers were disappointed. The next stop on my crawl was Black Hammer Brewery. This was a mile walk headed sorta back in the direction of the hotel. This section of the neighborhood was primed for a renewal. You could tell people were starting to move in and clean up. 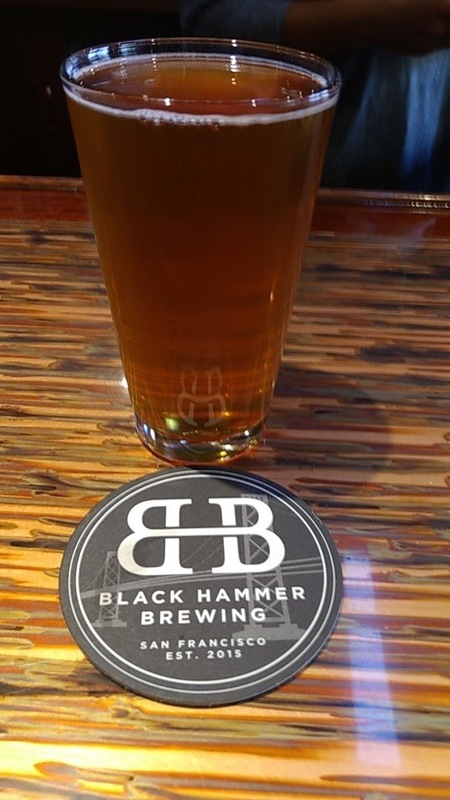 Black Hammer was another newer brewery, but with plenty of seating space. The entrance was a split top/bottom door that at this point of the night I struggled to open correctly. I got a seat at the bar and was so excited to see a bowl of peanuts. I was at this point 3 high alcohol percentage beers in, walked about 2.5 miles and had little water or food. I ordered Black Hammer’s signature beer called Sparkle Pony. I think I could only best describe this beer as cotton candy in the form of a 6.9% blonde ale. It had a slight and not overpowering sugary taste. It was refreshing after the heavier, darker beers so far. I also thought it would be a good idea to get some water here. However, they did not serve water at the bar. They had a water cooler at the other side of the room. 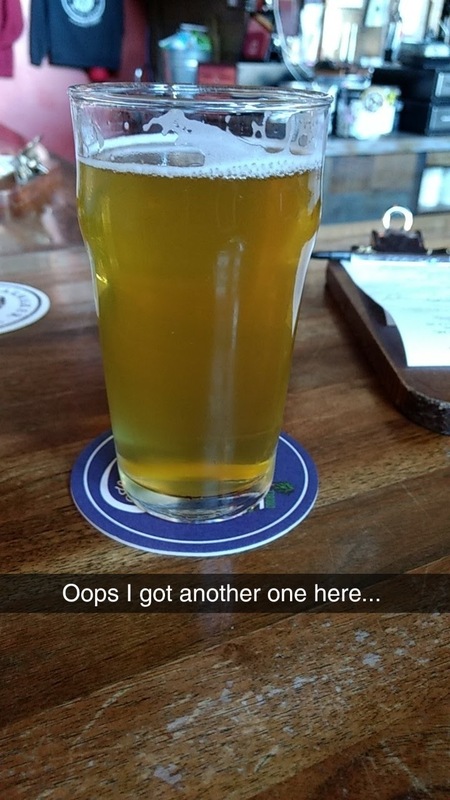 I could have gotten a glass of water, but my beer was in front of me and the water was not. I passed and planned on water at my last stop. My last stop was 21st Amendment Brewery. It was just a couple blocks from my last brewery on the crawl. 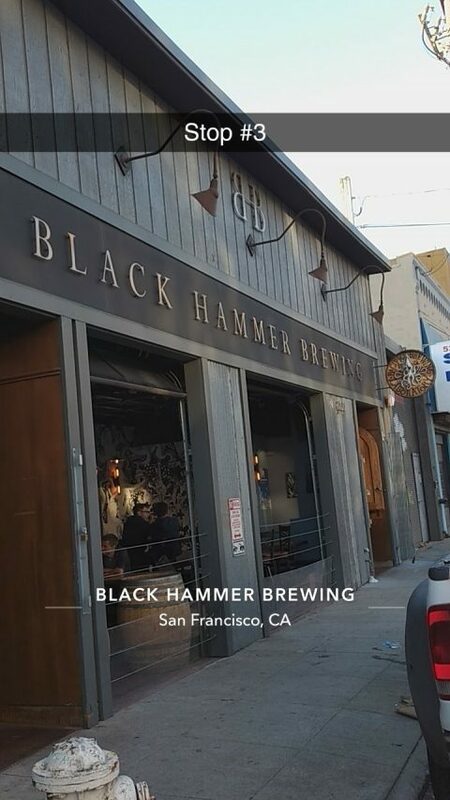 They have a smaller brewery in San Francisco. 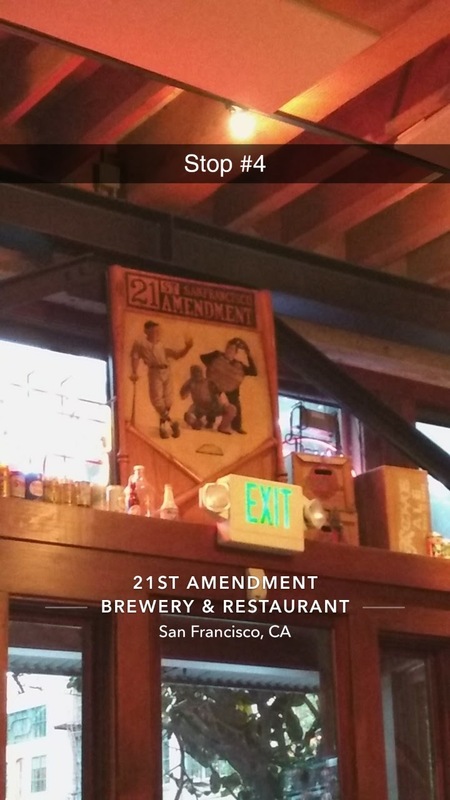 21st Amendment is now known nationally, mostly for Hell or High Watermelon, a very refreshing but fruity beer. By now it was about 8:30 PM, I drank 4 pretty heavy beers, walked about 3.5 miles and still needed dinner. 21st Amendment was the only brewery I visited that night with a proper kitchen. I ordered the Enjoy Porter, a 6.6% beer that was just OK, and the fish and chips for dinner. It was also recommended to me I should have ordered the burger. They also had a really great looking Linguine Alfredo special that night I kinda regret not getting. 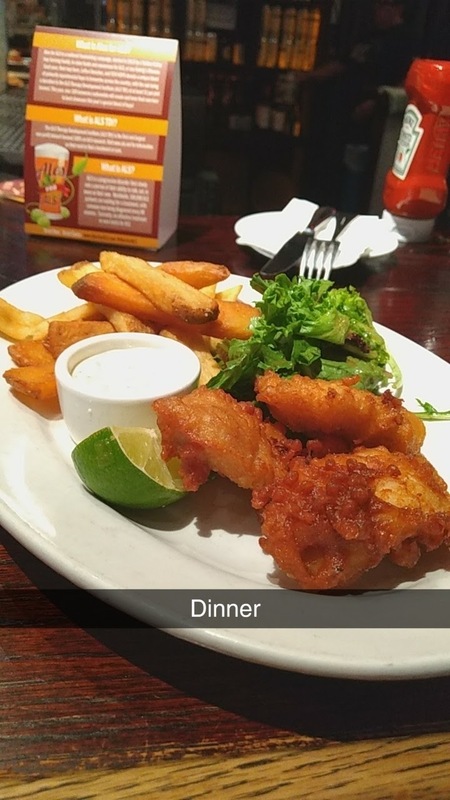 The fish and chips were good but left me still hungry. I think I’ve gotten so used to the size of fried fish in Pittsburgh and have unrealistic expectations elsewhere. I may have had a glass or two of water at this point as well. Maybe. I decided I needed to get at least one more beer to finish out the night. I got the Brew Free! or Die IPA (Blood Orange). The beer was 7% and refreshing for an IPA. Nice bold citrus flavor which was what I wanted at this point. In case you were not keeping track, that was 6 craft beers ranging from 5.6% to 11.5%. It was safe to say I was a little more than tipsy by now. Walking back to the hotel was an uphill battle. 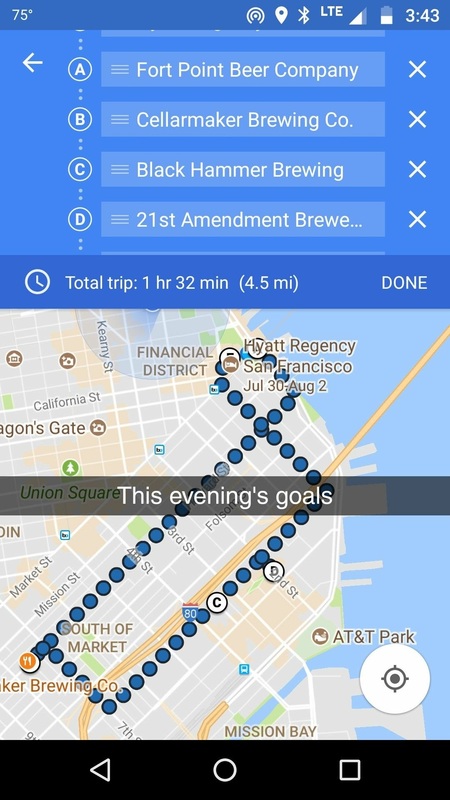 Literally, the walk was almost all uphill from 21st Amendment. I finally got back to the hotel around 10 PM. I was exhausted and not well hydrated. I made some tea, laid down and passed out without drinking it. Let’s just say the next morning was a little rough, I ordered a large breakfast and I still had to fly in the afternoon. I was also really disappointed in myself that I hadn’t saved the Instagram or Snapchat stories. It would have made for a great thing to look back on. Or at least I thought I hadn’t saved them. Since I’m not an avid Snapchatter, I didn’t notice for over a month that in my impaired state I did in fact save the whole journey to my memories. Those images are now scattered throughout this post. Now for the disclaimer, what I did probably should not be tried by everyone. I do not recommend wandering through strange cities alone getting slightly more inebriated along the way. If you are going to do this alone, let people know where you are going. Also know your limits. Participation in any crawl, know when you need to call it quits. No one likes a sloppy mess. The other obvious things of drink responsibly and be of legal age. Would I do this again? Of course! This was an awesome idea. More cities need to have so many microbreweries so close to each other.